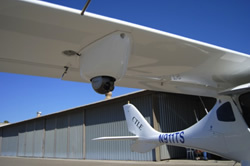 The system was installed in a Flight Design CTLE light sport fixed-wing aircraft, a safe, reliable and efficient platform. The featherweight TASE 400 with its intuitive controls and high quality sensors was the perfect fit for our missions. The system is used to respond to in-progress crimes, in support of search warrants, locating illegal marijuana cultivation sites, and assisting in other narcotics investigations. During a routine patrol, the aircraft was called in to locate a burglary suspect. Using the IR sensor, he was located and tracked as he jumped fences until the crew directed patrol deputies to the suspect's location. The continuous-zoom IR sensor combined with the scene-lock software and the Moving Map function made this night capture possible.